Oh hey, remember when BMW released the track-ready, water-injected M4 GTS Concept? Wow, what a neat concept that was. Just a concept, though, of course. SYKE! 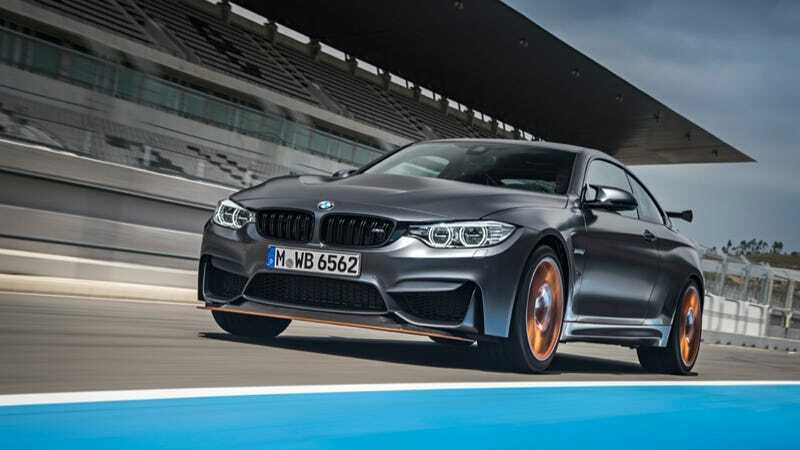 They’re actually building it, and just calling it the BMW M4 GTS. We never ever never ever ever saw this coming. Amazing, BMW. Truth be told, BMW’s been doing this sort of “concept” bait-and-switch for years, probably as just a bit of weirdness in its roll-out promotion strategy. But do you care? Hell no, you don’t care. What you care about is that it’s a BMW M4 GTS. And unlike super-hot M track stars of yore, this one’s actually coming to our golden shores. 300 units, out of a total production run of 700, are finally going to make it here to the United States. Water is injected as a fine spray into the intake manifold plenum chamber where it evaporates (phase change), significantly lowering the temperature of the intake air. This action reduces the final compression temperature in the combustion chamber, minimizes the risk of knock and allows the turbocharged engine to operate with higher boost pressure and advanced spark timing. The result is increased power and torque, and a substantial improvement in efficiency. Despite the extra power output, thermal stress on all performance-related components is reduced. All of these features ultimately help to diminish wear and prolong engine life. How very engineerish. When the outside air temperature rises about 68º Fahrenheit, the system can inject more water than is normal for maximum cooling performance. The whole system, including a 1.3-gallon water tank, sits under the floor of the car, and water shoots out of the injectors with the pressure of 145 pounds per square inch. Under normal driving, BMW says you should only have to top the water up every fifth refueling or so, like you’re driving an old steam engine. Take it to a track, where this thing truly lives however, and you’re looking at topping up the water tank every time you’re putting fuel in it. So there’s that. It all goes straight through a seven-speed dual-clutch gearbox, because that’s apparently how you do track things these days. But that makes sense, because this car is meant for going fast enough to light your hair on fire on the track. Carbon-ceramic brakes help you stop, and that big carbon fiber wing out back make sure you stay on the track.